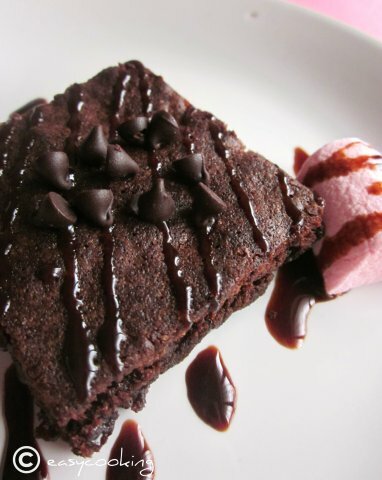 Easycooking: Tribute to Katharine Hepburn Brownies~For my li'l candy!! Tribute to Katharine Hepburn Brownies~For my li'l candy!! Wishing all of you a very Happy new year!! New beginnings sound so much better with a sweet.The moment I sat down to write this post,the first thing which came to my mind was that,Nags posted the same recipe in the beginning of 2010 and I am positive she too started the post with a similar sentence.Isn't it true Nags,my memory is sharp that way,hehe. The name of the Brownies,is what intrigued me.I don't usually need an excuse to bake a brownie.I am weak-kneed the moment someone offers me a brownie,unable to resist it even with all the will-power in the world.I collect recipes of Chocolate Cakes,Brownies and Nankhatais like there's no tomorrow.So it was no wonder I wanted to try these too.I finally got around trying this last month since I got my own copy of this book,yay!My first recipe from the ever-popular BFMHTY. I made these again for my darling li'l niece,one of the two candies in my life.She is celebrating her birthday today and she gives me competition when it comes to relishing these fabulous tasting goodie.Of course,the difference being,I eat it with the word 'guilt' written somewhere in the back of my mind,whereas she relishes it with absolute pleasure!! One of the best brownies I've baked so far,this one is perfect-has a beautiful crust and is so fudgy and gooey[thanks to the chopped chocolate added into it]and with the crunch of walnuts in every bite-absolute pleasure!! Grease and line an 8' square tin[I lined the tin with parchment paper and then buttered and floured the paper]. Sift together the flour,cinnamon[if using] and salt,keep aside. Melt the butter in a microwave OR in a stainless steel pan placed over a saucepan of simmering water. Sift in the cocoa powder and the instant coffee powder and mix well. Let it cool and come to room temperature,about 3 minutes. Using a whisk or rubber spatula,beat the eggs into the saucepan one at a time. Next,stir in the sugar and vanilla (don’t beat anything too vigorously — you don’t want to add air to the batter), followed by the flour mixture, nuts and chopped chocolate. Scrape the batter into the prepared tin and bake for 30-35 minutes,at this point,the brownies will still be gooey but the top would have a dry papery crust. Transfer the pan to a rack and let the brownies cool for at least 30 minutes. Turn the brownies out onto a rack, peel away the paper and invert onto a cutting board. Cool completely before cutting into 16 squares. [My brownies look a little on the thinner side coz I baked them in a 9' tin as opposed to an 8' one-doesn't affect the taste in anyway though!!]. Enjoy and here's wishing you a superb New year once again!! beautiful recipe to start the New year on a sweet note. wish you and your family a very happy new year and a great birthday to your niece. between, hope you have received my mail with the addresses. They look absolutely delectable--- YUMMMMMM ! Have a Great 2011 ! Fantastic and gorgeous looking brownies..sooo tempting! Wishing you n Ajay a Very Happy NY! Oh my! 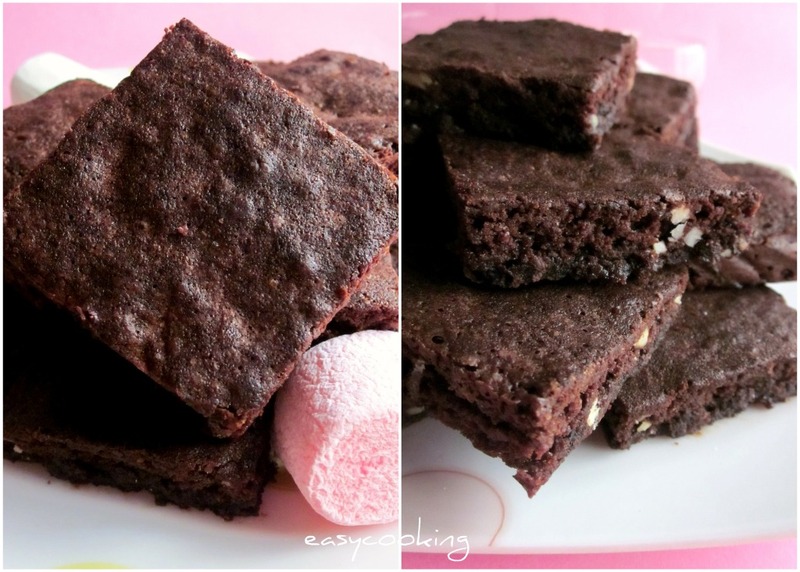 These brownies look absolutely lovely! Happy New year! Decadent looking brownies.... Prefect looking with those pink marshmallows. Nice recipe..... YuM! Happy new year dear. Wow, the brownies are something to melt for. Beautifully done. Great brownies!! Season's greetings to you!! Wish you and A a great year ahead Divya.. Boy!! These sure look super-duper yumm and very inviting! Loved that pic on the header, the sauce, the chips and that blob of ice-cream.